Usually I’m all for the change of seasons. When fall and winter edge out summer, I’m a cheerleader for change, relentlessly annoying to friends who prefer warm weather. But this year, after an unexpected career ending and sudden hard drive death, shorter days and cooler temps will take some getting used to. 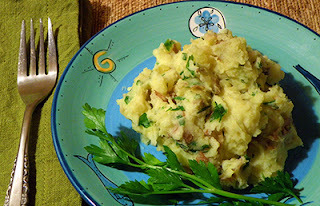 In the meantime, while recovering bits and pieces of the old hard drive, I came across some mashed potato recipes I’d written almost a decade ago and completely forgotten about. Nothing works faster than warm comfort food to make the darker time of year seem brighter. Well, almost nothing. When I moved to Santa Cruz, several decades ago now, I was inevitably introduced to potatoes mashed without peeling, a new concept to me. More vitamins and minerals are left in this way, the locals said. Although rather weird at first, this became my preferred style of mashed potato. I have since learned that nearly as many vitamins and minerals are preserved in potatoes that are peeled after boiling. One former roommate achieve what he called “perfect balance” by peeling half of the potatoes before boiling. Thin-skinned red potatoes are good mashed whole, thicker-skinned Idahoes not so much. Use your creative judgment in determining how many to peel. There are two ways to ruin mashed potatoes. The first is to mash them with high-speed appliances such as immersion blenders or food processors. Yellow potatoes are especially prone to turning gluey if over-processed. Either mash them by hand or use an electric mixer on a very low speed. The second potato no-no is serving them cold. Avoid this by preparing them just before serving time and heating the milk, butter, and other cold ingredients before adding them. In this recipe, be sure to chop the herbs finely and take the time to heat them in the butter, otherwise they can have a harsh texture. 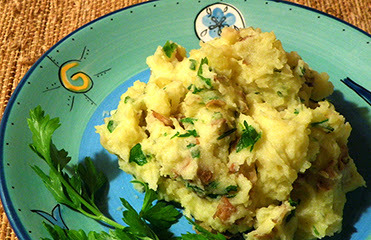 Enjoy mashing it up this week and do share any mashed potato variations that you like in a comment. There is no such thing as an excess of comfort food ideas. 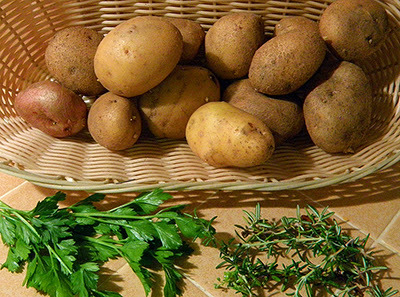 Scrub potatoes and remove sprouts and skin blemishes. Cut in half and put in 2 quart saucepan. Add water to just cover potatoes. Add salt. Bring to boil over high heat. Lower heat and simmer for 20-30 minutes, till tender. 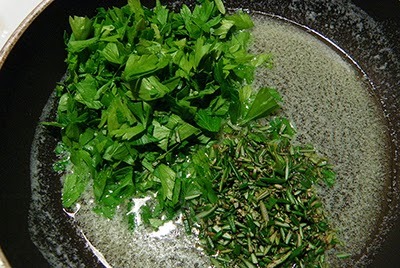 Meanwhile, snip parsley leaves from stems with scissors. Snip or chop finely; you will need ¼ cup. Wash rosemary and remove blossoms and loose woody material. Snip leaves from stems with scissors, then snip or chop finely, to make 1 tbsp. Heat 2 tbsp. butter in small frying pan over low heat until melted. Add chopped parsley and rosemary. Sauté until rosemary is wilted. Heat the milk or cream in a small saucepan or gently in the microwave until warm. Add the remaining 1 tbsp. butter. Drain potatoes thoroughly. 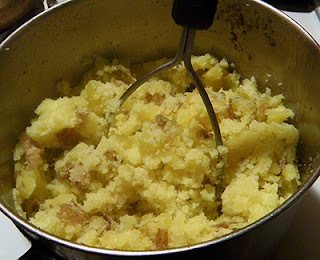 Mash with a hand-held potato masher, including the skins. Add the warm milk mixture and whip with a fork till smooth and fluffy. Stir in sautéed herbs. Serve immediately garnished with parsley or rosemary sprigs. Yum! So true calling these Santa Cruz-style...I didn't start leaving the skins on until I moved here. Actually, I didn't start making them from scratch until I moved to Santa Cruz, lol.